The connections of Graphic have resisted the opportunity to over tax their summer staying find and have opted to give the five-year-old a break. The Michael Moroney and Chad Ormsby-trained gelding cleared maiden ranks in October and swiftly moved through the grades to win the Dunstan Feeds Championship Final at Ellerslie on New Year’s Day. 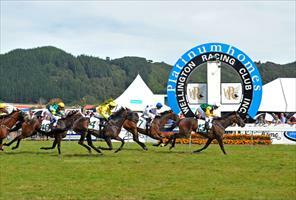 Wellington Cup to take his career record to five wins from eight appearances. “He went out pretty much straight after the cup and we’ll bring him back for the spring,” Ormsby said. “Obviously we were thinking about a trip to Sydney for him, but we all agreed he’ll be even better with a spell. “He’s had a few little issues with his legs and if we kept on pushing they could have ended up major ones. Moroney and Ormsby currently sit in sixth equal spot on the trainers’ premiership with 28 winners for the season and The Last Shower looks a good chance to advance their tally at Ellerslie on Saturday. The mare was a strong-last start second behind Porotene Lollipop at Te Rapa and will again be ridden by Michael Walker in the Rating 75 Macular Degeneration NZ Mile. – NZ Racing Desk.